Time for a Go! Baby Giveaway! I am back from beautiful North Carolina ( many thanks for all the support and kind words from my friends here. You guys are amazing!!!!!) and so it is time to have the Go! Baby giveaway! This one is for a Go! Baby and three dies of your choice. Thanks everyone and Good Luck!!!!!! Is #1 good or bad??? I am already a follower of yours :) Thanks. I'm a follower (been here for a bit)! I've already subscribed to the Accuquilt newsletter. 2.25" Strip Cutter, Carefree Alphabet, 6" Circle! This is exciting. Thanks. I'd pick the Drunkard's Path, an HST die, and the tumbler die. Thanks for a chance to win! i think i'd like to try drunkard's path, apple core, and hexagons. I would love to have the small rag die, the birds die and the tulip die! Thanks for the chance to win!! Stars, Fall Medley, and half square 4" finished dies. Thanks for the giveaway! I already get the Accuquilt email. I already like Accuquilt on FB. I'm a follower love your blog. I am a follower!!! Thanks SO much for the opportunity!! I would choose Circles, drunkard path and Tulip dies. I would love the hexie set, the alphabet set and critters. I love these the most. But if I win I am sure I will be buying a lot more. I am a follower - love your blog. I am an email subscriber with Accuquilt. ...and I already get the newsletter...LOL...Thanks SO much for doing this! Have a great day! Just became an official follower... I've subscribed for a while. 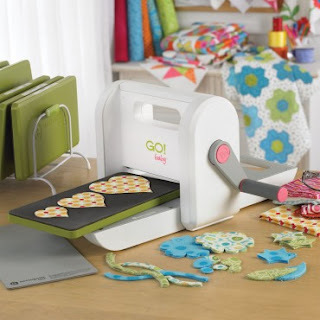 I'd love a Go Baby, I've seen some awesome quilts made with the machine! And liked Accuquilt on FaceBook, does that get me a second entry? I like to double my chances! I really want a Go Baby! I am a new follower. I found your bolg on accident and it is so cute! I've been a follower in my google reader for quite a while, the Go! looks like fun! It was really hard to choose just 3. I would say Go!Fall Medely, Go! Holiday Accessories, and Go! Rose of Sharon (this one is my favorite!). It's so hard to choose but I'd probably choose the apple core, rob Peter to pay Paul and the tumbler - I've always wanted to make scrappy tumbler quilts but the cutting puts me off! i know the three dies i want off by heart, they are the drunkards path, 5inch square and the 2.5inch strip cutter, they look so fun. Yes, I 'liked' on fb. I'd like it even more if it was at my house! I would definitely choose the tumbler die, and I think the circle & the hexie. I would love to get a Go! with Drunkard's Path, apple core, and tumbler!!! I am already signed up for their newsletter! I would love to have the Baby. It's hard to choose which dies, but I think I'd get the Calico Cat, 4 1/2" square multiples, and the GO Birds. I have signed up for the emails from AccuQuilt. I "like" AccuQuilt on Facebook. I would pick the 3 1/4 squares, holiday medley, and circles. So much fun to be had! Would love to have a 1.5" HST , 3.5" strip and 4.5" strip dies. Too many to choose from, they all look good. I'm on Fb. Signed up for emails. There are SO MANY dies to choose from! I really like the website! I already get Accuquilt newsletter. I would love the 2.5" strip, the Parallelogram-2 3/4" x 2 1/2" and and the Hex die! Thanks for the chance! I would like the Funky Flowers, Hexagons and Circles. Any circle, tumbler, and strip. The more I see the more I think I'll have to put the Baby Go on my christmas list. And I get Accuquilt's newletter. You're right, there are too many to choose from. I would want the circles, the drunkard's path, the Rose of Sharon or Funky Flowers, and the hexies. Thanks for the chance! I get the Accuquilt email! I "Like" accuquilt on FB! I like AccuQuilt on FB. Hi, thanks for offering, I'd really love a circle die, the feathers and diamonds would be just great. Yes, I am a follower of your blog! I have signed up with Acuquilt! I did like Acuquilt on FB. Thanks again for hosting this! I am a follower in my Google Reader. I would love the Holiday Medley, Holiday Accessories, and the Go Circle-2", 3", 5". Snowman project! I'm a follower of yours...thanks for the chance to win! 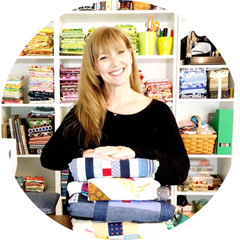 i signed up for accuquilt e-mail thanks for the chance! I'd pick the 3.5 inch tumbler, 2.5 inch strip, and 2.5 inch square. i "like" accuquilt on FB :) thanks for the chance! the dies i would love are the dove, sunbonnet sue and the critters all very cute!!! New follower. Have been reading your blog for a bit. 3 dies: 5inch square, 4inch half square triangle, 2 1/2 inch strip cutter!!! Already signed up for Accuquilt newsletter. hello & thanks so much !! I am already one of your followers ; I saw this in my feed ! I signed up for ACCUQUILT's email ! I like ACCUQUILT on facebook ! thanks so much ! Oh what a great giveaway. I am a follower through Google reader, I hope that counts! Thanks. I would choose the hexagon, the tumbler and the flower! Thanks again. drunkards path, tumbler, apple core, 2.5 inch square...oops, that is 4! I love Drunkard's Path, Hexagons, and Tumbler. Thanks for the chance to win! I love the bird die! and hearts! and you have to have some triangles for buntings! LOVE them! Favorite die? That's easy. Double wedding ring. Started saving scraps for this a while back. I've been following your blog for a month or so now. Working on my 5th quilt so far. Signed up for the Accuquilt email. Didn't know about this... Thanks! Been following your blog for about a month or so. I really like the bird die. I'd love to do a wall hanging or a pillow! Thanks for the giveaway!!! I'd choose the 2.5" strip, a HST, and the 4" square! I cannot wait to use the alphabet and numbers! I've wanted to make my munchkin an alphabet quilt for-EVER! I've been a follower in my GR for a while - I love your blog! Thanks for the giveaway! I'd choose Drunkard's path, tumblers, and apple core (please! And since I've been trying to win one of these baby's, I'm already signed up for Accuquilt newsletter! I "like" AC on FB too - thanks again for the giveaway! Im already a follower. Thanks for the chance to win. I already get the accuquilt newsletter. I already liked Accquilt on FB. Thanks for the giveaway. I would get the pumpkins, christmas accessories and birds. I am a follower. Come on lucky numbers!!! I already receive the Accuquilt newsletter. Thanks for the giveaway! When (not if) I win I will be picking Drunkard's path, apple core, and funky flowers. Thinking positively never hurt anybody. I like Accuquilt on Facebook. I am a blog follower! I subscribe to the Accuquilt newsletter. Oh, if I should be so lucky, I'd like to have the apple core, the tumbler and the hexagons. Of course, that was after I changed my mind ninety gazillion times. Thank you, Accuquilt for this awesome giveaway. My favorite dies are the funky flower, the birds, and the Rose of Sharon! I am a regular follower of you blog! I receive the AccuQuilt newsletter! I'd like the drunkards path, tumbler and birds. I receive the AccuQuilt newsletter too. Circle, Tumbler, and Birds ... for starters! This gadget looks like a real time-saver for some of the more tedious cuts. I would love to get the hexagons, the value die, and perhaps one of the circle dies. Thanks for the giveaway! I also get the accuquilt e-mail. and I like accuquilt on FB. I already receive the Accuquilt newsletter. I think I'd choose 2.5" strip, drunkard's path and hexagon dies, please! Yup, I'm a happy follower. I would love the small tumbler, 2.5" strip cutter and the funky flower dies. I would start with some basics... Hexagons, circles and squares. Then go crazy with all the other awesome shapes!! Thanks for the awesome giveaway! I subscribe to the Accuquilt updates - love them!! And I'm a follower. Sometimes I'm a leader too!! I always change my mind which plates I would get! Dresden, Drunkard's path, maybe hexies. Already like Accuquilt on FB! I like Accuquilt on Facebook. Thanks! I would choose the 6" circle, the rag square, and 3 1/2 x 6 1/2 rectangle. Just thinking about it sound like too much fun! Thanks! I am signed up for the AccuQuilt email. Thanks! I would love to win the Drunkards Path, Tumbler and Rose of Sharon. Great giveaway!